Teresa Coryell House and Chip House loved their home in the Lynnhurst neighborhood of Minneapolis. Committed to staying in the area and keeping their kids in the same school, they worked with SALA Architects principal Paul Hannan on a series of remodels to make the center-hall Colonial more livable for their growing family. But, finally, after maximizing their space inside and out, they accepted the inevitable and began house hunting. “We had resigned ourselves to moving to the suburbs to find the space we wanted,” says Teresa. Then a 1926 Tudor in the same neighborhood came on the market—one of a handful of homes that boasts a superb, deep lot with plenty of room for kids to play, a patio, a garden, and even (someday, hopefully) a pool. The house, while charming, was not exactly what Teresa had in mind—right house, wrong style. “I’m not a Tudor girl,” she says. But she knew it had potential. 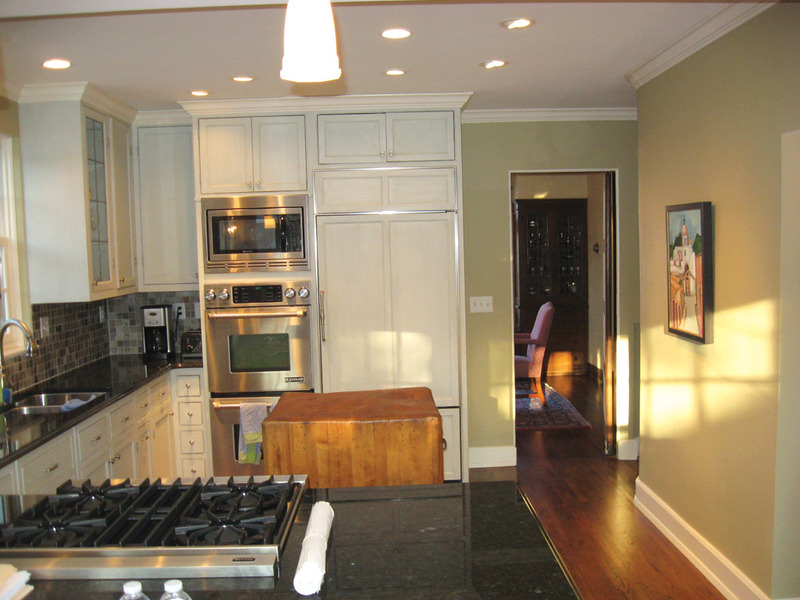 So began a whole-house renovation in the spring of 2013. 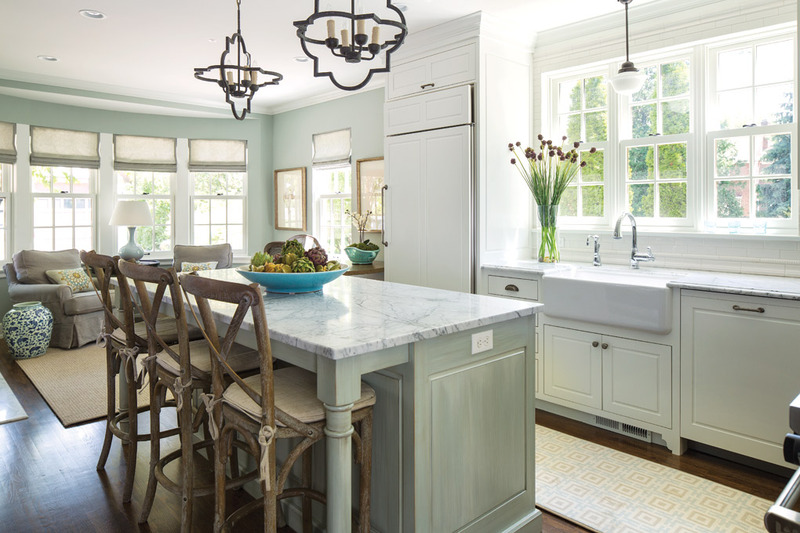 Teresa and Chip brought in architect Hannan, Erotas Building Corp., and Renae Keller Interior Design to transform the house into the home they envisioned—tasking the team with finishing the project in six months. Thanks to cohesive teamwork, they met that ambitious deadline, and the family moved in just before Christmas. 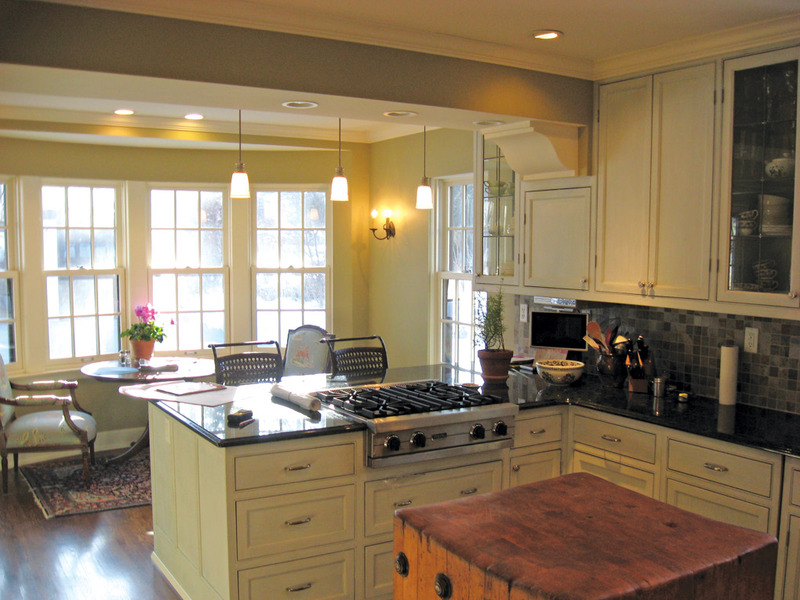 He reconfigured the space, moving the back staircase to expand the kitchen, eliminating a small, narrow study behind the old staircase, opening a connection to the living room, creating a kid-friendly powder room easily accessible from the back door and a more functional mudroom, and adding a fireplace in the sitting room adjacent to the kitchen. The understated finishes throughout pay homage to the pedigree of the house. 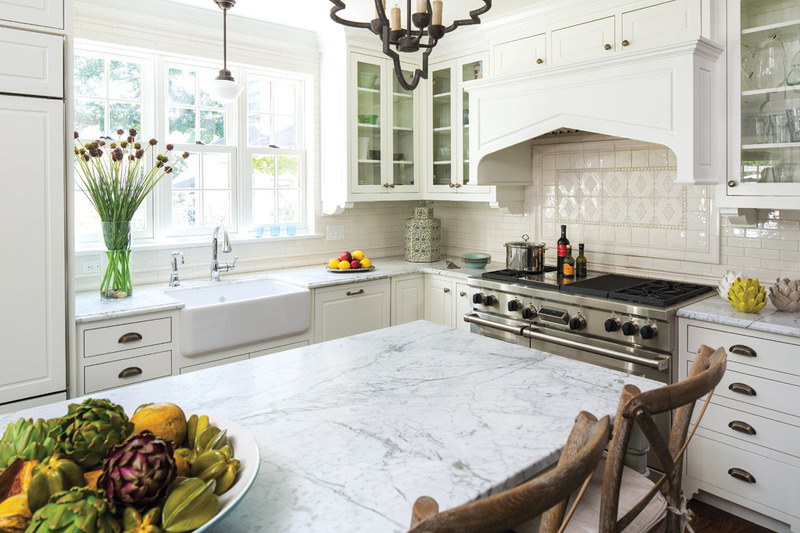 Teresa and Keller chose honed Carrara marble for the island and perimeter cabinets, subway tile for the backsplash that extends to the ceiling, inset decorative tile above the range, wrought-iron pendants over the island, and antique pewter hardware for the cabinetry. The custom walnut hutch, a built-in piece designed to look freestanding, is finished with a zinc top that will softly patina over time. The dreamy pale palette is anchored by oak flooring refinished with a walnut stain. The striated robin’s egg blue of the island cabinet, custom glazed by Darril Otto, allows just a peek of weathered walnut to show through. The sitting room fireplace, with its carved tile surround and marble hearth, supplies just the right ambiance for Teresa, who has spent a lot of time on the East Coast and always wanted a kitchen with a cozy hearth room. Now, with the fireplace and comfy armchairs, she can live her dream: reading a book by the fire while cookies bake in the kitchen—though, she laughs, she has yet to manage it in her new kitchen. Architect: Hannan, Erotas Building Corp.